Home / Analysis and Strategy / Kerosene Volvo ???!!! Is Andhra Pradesh State Road Transport Corporation (APSRTC) running Volvo buses (Garuda branded luxury coaches) on kerosene? 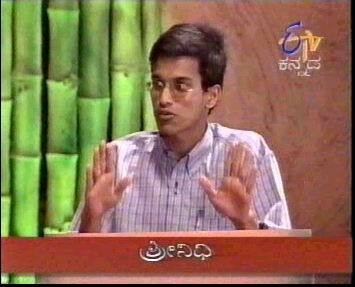 Bangalore auto drivers (Indian auto drivers in general) were famous for running their autos on kerosene (ಸೀಮೆ ಏಣ್ಣೆ, मिट्टी का तेल्), due to cost advantage of the subsidized fuel. But internal combustion engines were not designed to run on kerosene and these autos were leaving behind a thick black exhaust, polluting the environment and spoiling health of people around. 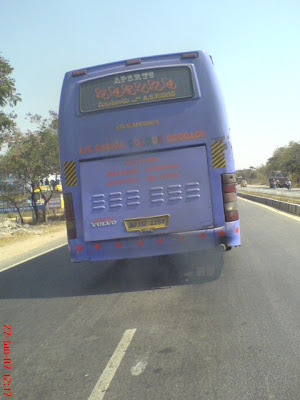 Last Saturday, on 27th Jan 2007, eNidhi India CBO (Chief Blogging Officer) Shrinidhi Hande spotted a Volvo B7R, owned by APSRTC, running on NH 9 (Hyderabad-Vijayawada route) which was releasing an unusually thick exhaust. I was rather shocked to see that. See the video below, focusing on exhaust pipe. Technically, Volvo B7R buses incorporate some of the finest technology available in buses world wide. The B7R (B7R stands for Bus, 7Litre, Rear engine) have turbo chargers and intercoolers, meant to optimize fuel usage and comply with international pollution norms (B7Rs sold in India are Euro II compliant while in UK Euro III versions are available). Pollution caused by Volvo vehicles are far lower than any other Indian made heavy vehicles. Still this particular vehicle was an exception. At a normal speed of 60 kmph on a plain highway, this vehicle was not expected to release black fume. or was the diver using inferior quality fuel? Or the vehicle was not serviced for long time? It is time APSRTC spares little more attention towards its Garuda coaches, each costing INR 6 million plus. A proper maintenance and supervision is necessary to increase the life the vehicle also to protect its reputation. For a better description of Volvo vehicles click here and for a .pdf report on my visit to Volvo India plant at Hoskote, Bangalore, click here. Do AP has VOLVO Buses for public transport? That's interesting! Yes. AP has Volvo B7Rs for inter city public transport. i don't think you can run a Volvo on kerosene. The Volvo B7R uses a diesel engine, which is a compression ignition engine, as compared to a spark ignited engine used on a petrol vehicle. Kerosene just won't work on a compression ignition engine. the black smoke may be a result of poor maintenance of the engine rather than anything else. I have seen many Volvos belching thick black some, this is not unusual.